The other night, I had the Fireman take some chicken out of the freezer to defrost while I was driving home from Manchester, and on the way, I was mentally flipping through my recipe rolodex. I’d done salsa chicken, hawaiian chicken, baked chicken, chicken enchiladas, chicken soup, grilled chicken, chicken salad…I think you get the point. Anyways, I got home with some semblance of an idea of what to do. First I chopped up some onions and garlic and sauteed them in an iron skillet. A few minutes into it, I added a can of green chiles and let it all cook on low for a while. I sliced up the chicken breasts and pan cooked them until they were browned on either side. When it was all done, I chopped the chicken up, mixed it with the chiles and onions and a can of Trader Joe’s Cuban Style Black Beans. That got dumped into a pan, covered with some enchilada sauce and baked for about 10 minutes at around 400 degrees. 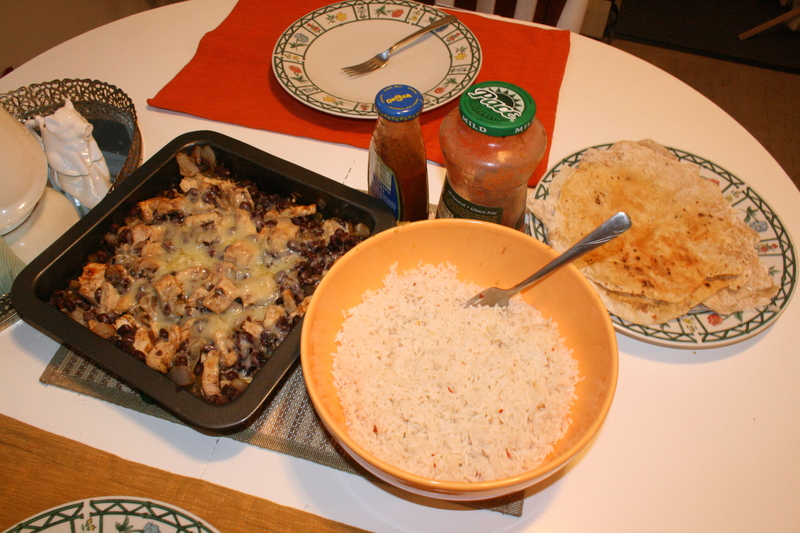 While I was multitasking (like a champ, I might add), I was also cooking rice in the rice cooker and making tortillas. I tossed shredded cheese on top of the chicken until it was melted…and voila! Mexican Chicken Throw Together!! Your Mexican throw together sounds delicious. My home is in New Hampshire also, not thirty minutes away.